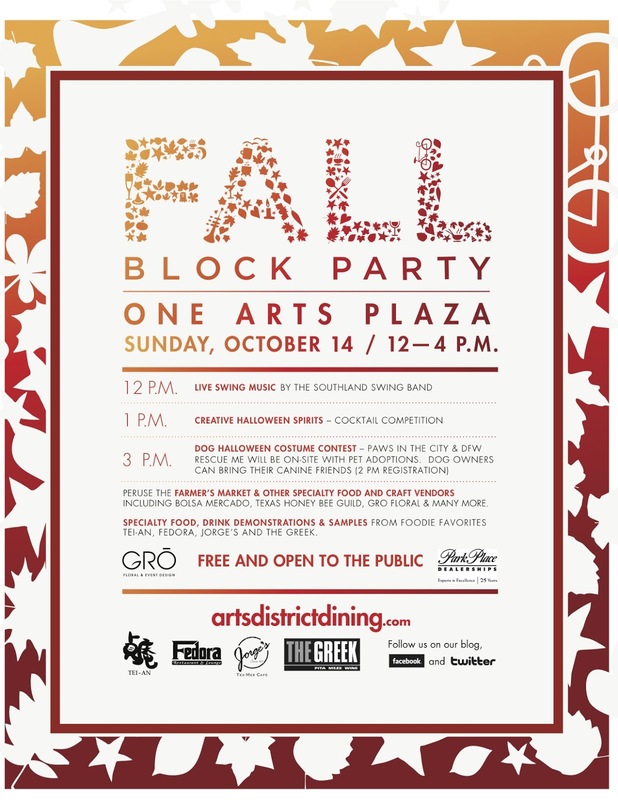 One Arts Plaza will host its third annual Fall Block Party on Sunday, October 14 from noon-4 pm as part of the Dallas Arts District’s Art in October Celebration. The Plaza will be closed off for pedestrian-only traffic where guests can enjoy food demonstrations from foodie favorites Tei-An, Fedora and Jorge’s along with newcomers The Greek and Café Des Artistes. Don’t miss the infamous Cocktail Competition at 1 pm with local celebrity judges CultureMap Dallas editor Jennifer Chinnis, Most Eligible Dallas cast member and Paws In The City activist Tara Harper, Mike Hiller editor of Escape Hatch Dallas, America’s Sassiest Lifestyle Guru Steve Kemble and moi, Cynthia Smoot. Seventeen local food and gift vendors, such as The Feather Junkie, Kruffles Dallas, Noble Coyote Coffee Roasters, Pop Star Popsicles and Three Dog Barkery, will set up shop around the plaza for adults, kids and dogs alike. The Southland Swing Band will provide a jazzy soundtrack all afternoon. Special thanks to floral sponsor, Gro Designs. Paws In The City, DFW Rescue Me and Greyhound Adoption League of Texas will also be on hand featuring pet adoptions and information. Be sure to bring your four legged friends for a Halloween Costume Contest at 3 pm! Host, model, actress and Dallas local LeeAnne Locken will serve as emcee for this fun-filled fall celebration. Admission is free and open to the public. One Arts Plaza is located at 1722 Routh Street, Dallas, TX 75201.